Xavier Bouin, founder and managing director of the Tan brand, has been living in Dubai for the past 20 years. After his success in the world of luxury with his first company Euroluxe created in 1997, he entered the nautical world by creating in 2009 the Tan Services company. He is the agent in the Middle East for Lagoon Catamarans and Hanse. His passion for sailing, especially multihulls, his taste for beautiful things and meeting Marc Van Peteghem led Xavier Bouin today to launch his own project, the Tan 66. The Tan 66, the story of 2 men, 1 passion, 1 dream. Xavier Bouin, and Marc Van Peteghem from the famous VPLP architectural office, imagined and created a new type of exclusive catamaran, the Tan 66. The Tan 66 was designed to sail at a very high speed with great ease. The Tan 66 is an innovative catamaran built entirely of carbon fiber for more speed and strength. Both helm stations, the central mast and front sails are there to make the sailing effortless while achieving top speeds. Tan 66 is more than highly performing, she’s also a benchmark in style and design. Tan 66 will be built at the Marsaudon Composite shipyard based in France. The yard is famous for its unique know-how and excellent workmanship in carbon composite material. 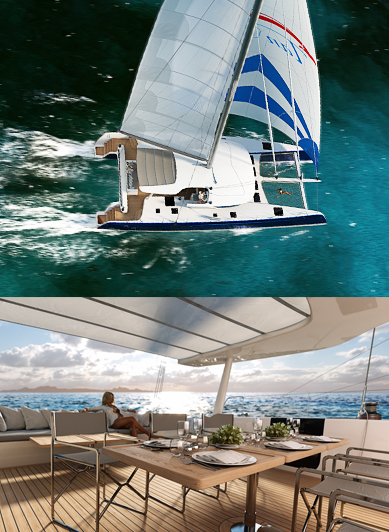 Amazing performance, great design, easy manoeuvring, luxury and elegance, Tan 66 is more than an exceptional catamaran, Tan 66 is Unique. Tan 66, the dream becomes reality.